GOLD PRICES fell over $15 per ounce against the Dollar on Monday, retreating to $1351 per ounce before regaining half that 1.1% drop as world stock markets surged and commodity prices rose on what headline writers worldwide called “stimulus hopes” across Asia and Europe. “China June inflation eases further, more policy stimulus anticipated,” said Reuters at the weekend after the world’s No.2 national economy reported the slowest consumer price inflation in 6 months at 1.9% per year for June, stronger than analyst forecasts but down from 2.0% in May. ” Abe to give order for new stimulus package,” said the Nikkei Asia Review overnight after Japan’s ruling coalition grew its Upper House dominance in Sunday’s election. Japanese gaming giant Nintendo’s share price (TYO:7974) has risen 65% since the new Pokemon Go app was launched free last week, recovering from 1-year lows. “Global stocks rally, markets look for more stimulus,” says Reuters, echoed by CNBC, Deutsche Welle and other news-sites ahead of this Thursday’s South Korea and Bank of England decision on interest rates. 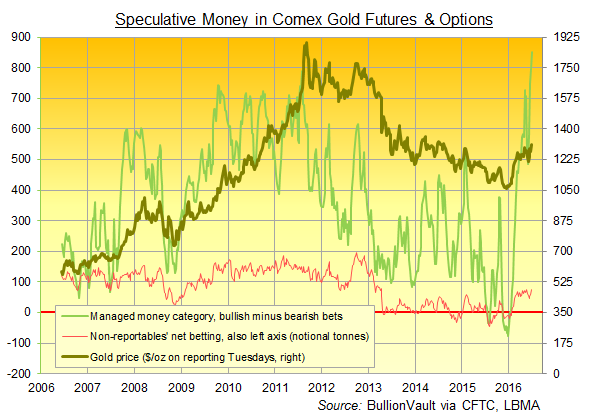 Latest data show hedge funds and other money managers taking the largest bullish bets on gold futures and options ever in the week-to-last Tuesday. Since the UK’s Brexit vote, “Korea quickly proposed a supplementary budget, Taiwan cut rates by 12.5 basis point, and China has let the CNY weaken,” note analysts at French investment and bullion bank Natixis. The British Pound meantime steadied as the UK’s ruling Conservative Party was left with just 1 candidate, current Interior Minister Theresa May, to replace failed Brexit Remain campaign leader David Cameron as prime minister. That helped debt gold priced in Sterling to £1040 per ounce, almost 3% below last week’s new 3-year highs. “Bank of England poised to slash interest rates to shore up economy,” says The Daily Telegraph, echoes by the Financial Times, The Guardian, the BBC and the rest of Britain’s media – although a blog at the British Bankers’ Association urges “caution”, as post-Brexit data have yet to start coming in, and the current 0.5% record low leaves little room for consumers or businesses to grow their borrowing in response to a cut. Major government bond prices retreated, edging yields higher from new all-time record lows, while industrial and agricultural commodities rose. Silver led the charge, rising almost 2% to touch $20.67 even as gold prices fell, but holding 3.5% below last week’s sudden spike to 2-year highs. nalysts at US financial services giant Citi now see gold prices averaging $1250 in 2017, with a 1-in-5 chance of “a possible severe exacerbation of already elevated US and global growth concerns” sending that up to $1440 per ounce.